Well, I guess technically, I'm late. But I didn't go to the comic book store so I have nothing to review. Since I only had two things to pick up (Deadpool Annual #1 and Spidey Sunday Spectacular #1) and Dan didn't have anything, two trips to the comic shop sounded a bit ridiculous. I'll just pick them up tomorrow when I head out to FCBD. As should everyone else. A lot of stores also make use of this day to have sales on backissues, trades, and hardcovers. Some of them have signings and turn it into a huge event, it just depends on the store. Or you can be like me and go to all of the ones you can in the Columbus area. So if you have a slight interest in comics, now's your chance to pick up some free ones and see what you've been missing out on. If you like comics but just don't have the money to stay up with monthly titles, you can grab some free ones today. And if you go to your shop every week to get the latest title, then grab some trades for cheap and consider the free comics as a way of thanking a loyal customer. Can't find a store around you? It's easy enough, just go here and you can get the information you need. As for me, I'll be making my rounds to the Laughing Ogre, Comic Town, and Packrat Comics (where I'll be able to meet Chris Sprouse of Tom Strong fame and Billy West of Futurama fame, as well as others.) I'm pumped. To end it, I've been playing around with stylization and techniques. So here's some recent, quick artwork that's been done in the last few days (Probably when I should have been working on finals). 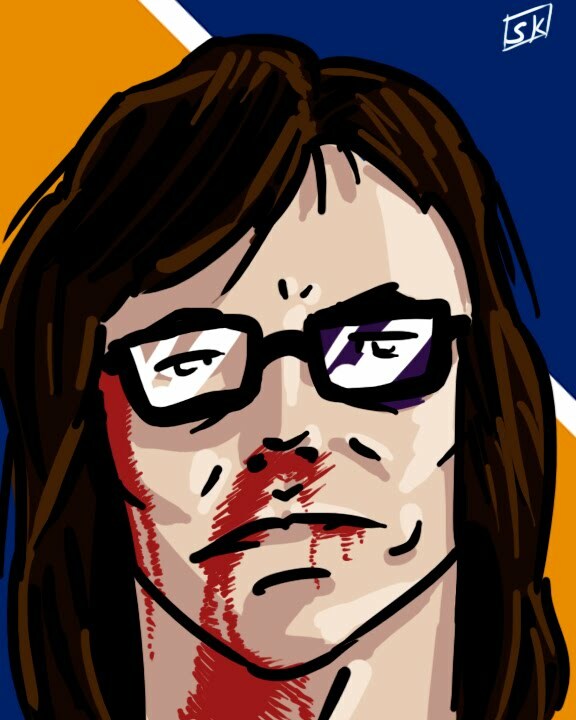 First, one of the Hanson brother's from Slap Shot (which is a great movie if you haven't seen it yet). Dan and I threw this on one day when I was in a hockey movie mood and he didn't want to watch Miracle (again, another great movie). I whipped this up during. 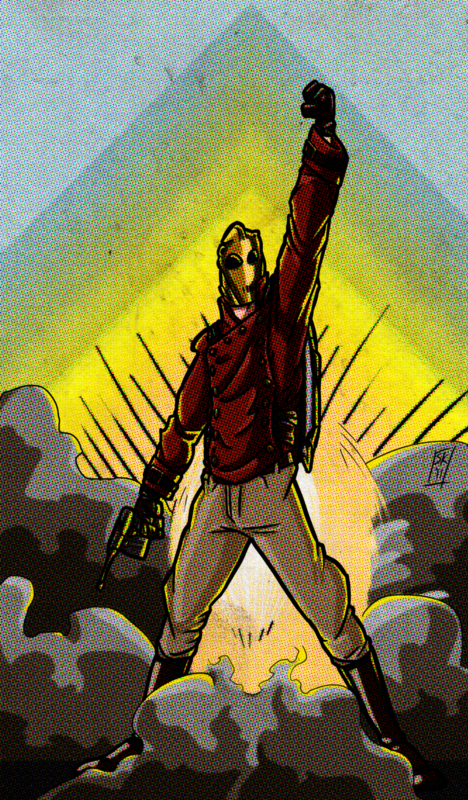 On to, The Rocketeer. I love everything about this guy. His retro-sci-fi-ness, his jetpack, his helmet, everything. I got stuck on Presentation and ultimately ended on the large one, but I decided to include the others if you were interested at seeing some other ideas. Next, The 11th Doctor. With this long, pill-shape head I've been playing around with, profiles make me question what I'm doing. 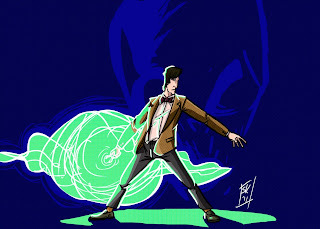 Yes, I understand he looks like Paul McGann, his chin and nose are all wrong and his legs could have been skinnier, but it was a quick sketch. I guess that's why I'm trying this. I also took some new routes with coloring and effects, which I'm in the middle on. Also, sorry for the JPEG compression. Finally, a Figure in a Cityscape project for my Figure Drawing class. 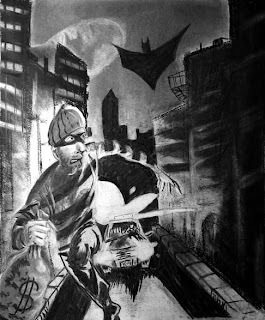 Of course, when I hear "figure in a cityscape" my mind immediately goes to Batman, so this was born. So that means reviews should be up Sunday. See you at Free Comic Book Day! Oh, and, P.S. I started using Tumblr and Twitter, so if you like those things, follow me up.